We don't drink, so it definitely wasn't ours. 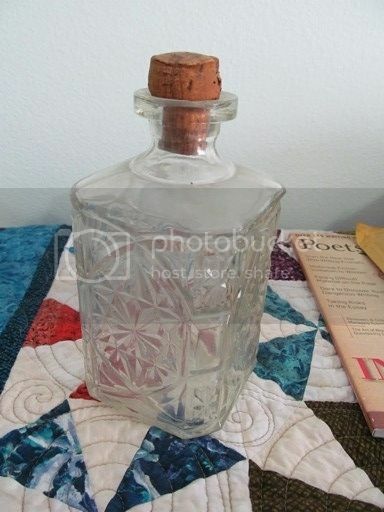 I did a little research and found out it's a pressed glass liquor bottle from a manufacturer in Puerto Rico, and was once possibly filled with rum. I doubt it's valuable -- I seem to remember my parents having bottles like these back in the seventies -- but it is interesting to see that it was hidden in the very back of a cabinet. Perhaps a previous occupant was indulging on the sly? If that's the case someone would have had to use a ladder or climb onto the counter to reach it. But what if it was hidden for another reason? 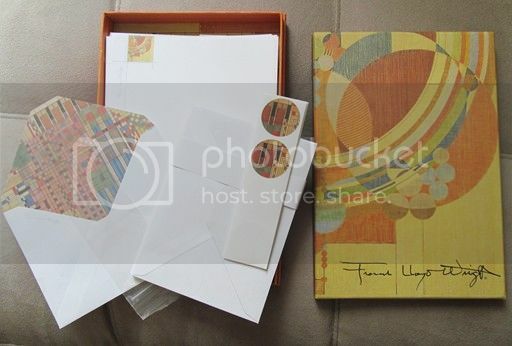 It's a beautiful stationery set in pristine condition, but it isn't mine. Since the storage unit came here completely empty (I know, I unpacked it before we moved) it's either a gift someone gave me that I forgot about, or it was left by a visitor. I've asked everyone but so far no one has claimed it. Since I'm a letter writer and architecture junkie, I'm happy to put it to use, but it does raise some questions. Why would someone go to the trouble of bringing a set of stationery on a visit, hide it in my storage unit, and then leave it behind? Mystery discoveries are great story starters. Imagine your character finding a beautiful old liquor bottle filled with something other than liquor: a message, jewels, rare coins, or perhaps something more gruesome, like teeth, or wedding rings. A stationery set becomes even more interesting when your character finds a half-finished frantic letter in the very bottom, or a list of names being crossed out, or old hundred dollar bills tucked in every envelope. Using a mystery discovery as a story starter is like undertaking a reverse treasure quest -- your character begins by finding the treasure, which compels them to backtrack to find out how it got there and what meaning it has. Have you ever made any mystery discoveries in your home that would make good story starters? Let us know in comments. The FLW stationary is beautiful. I can't get myself to spend money on things like that, but I can always appreciate it. Our house was built around 1950, and used to have a root cellar. We have a full basement, and there was a rickety built wooden door in the wall of the foundation that opened onto a small room. No light. Dirt floor. Smelled like a grave. Concrete roof that sagged alarmingly. Empty wooden shelves. We called it the Priest Hole, and were glad when we could pay to have it filled it. Perfect place to store a body or hide something. My best discovery was in our first house 40 years ago. That year, we had bought an old sea captain's house built in 1901. We were newly married and living from paycheck to paycheck. Thanksgiving was going to be a pretty lean dinner after having so many expenses. I was on a cleaning jag and emptied out a closet. There was no light in there so I'm wiping down the walls blind when my finger dipped into a knot hole. (The walls were made of old planks of cedar. Inside the hole was $50--a lot of money in the 70s. Who knows why someone put $50 in a knot hole or if it was a gift from heaven, but it was the best Thanksgiving we ever had. For some reason, things got better for us. We never struggled as much after that incident. Ooh, yes, but I don't want to share it, lol. Because I DO intend to use it in a story someday, and it's a little too unique to want to give away.